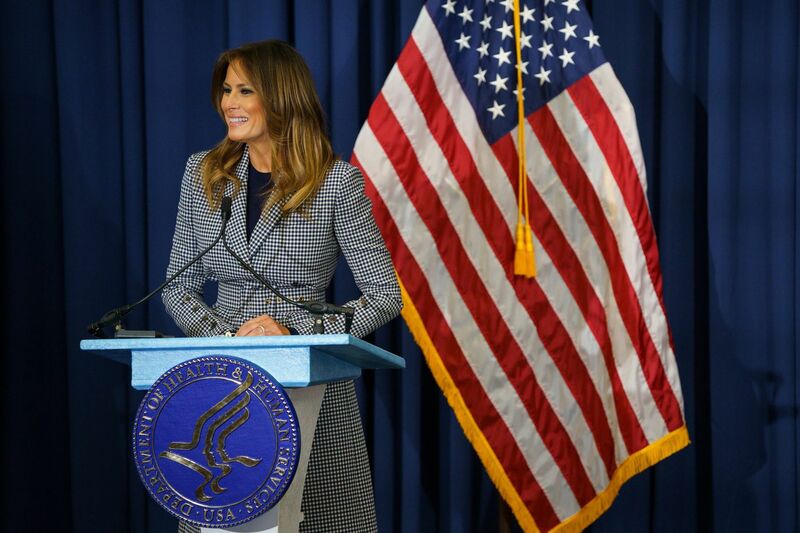 First lady Melania Trump visited Thomas Jefferson University on Wednesday to learn more about babies who are exposed to addictive drugs in their mothers' wombs, and to kick off a conference on the issue. The problem has exploded across the country with the opioid crisis. As a result, many newborns spend days or weeks being treated in a hospital for withdrawal symptoms, called neonatal abstinence syndrome (NAS). The first lady's visit was part of her "Be Best" initiative, which focuses on issues affecting children, including the opioid crisis. "Over the past year, I have learned a lot about NAS," the first lady said during brief remarks before pediatric and addiction specialists gathered in an auditorium on Jefferson's Center City campus. "Later on, I will meet with families affected by NAS. … I'm anxious to do all I can to shine a light" on the problem. Jefferson has long been a leader in caring for women in addiction and their infants. Last year, the medical center opened a residential treatment facility as part of its 45-year-old MATER (maternal addiction treatment education and research) program. The president's wife was accompanied by Alex M. Azar, secretary of the U.S. Department of Health and Human Services. He noted that the National Institutes of Health is funding a new study to evaluate treatment options for NAS, and the U.S. Centers for Disease Control and Prevention is stepping up efforts to gather data on the prevalence of the syndrome. In addition, Azar said, experts at the Jefferson conference planned to discuss how to use new information-technology tools to support long-term care and tracking of babies who experience withdrawal. The problem of drug-exposed newborns is hitting Pennsylvania hard. Nearly 3,300 such infants — 2 percent of all births — were delivered in the Keystone State last year, up from 788 in 2000, according to a Pennsylvania Health Care Cost Containment Council analysis. While the severity of newborn withdrawal varies, the symptoms may include inconsolable crying, tremors, muscle rigidity, and diarrhea. The babies are typically treated with decreasing doses of oral morphine or methadone, both opioid medications. Although some studies have linked newborn withdrawal to later developmental problems, most research is inconclusive, and the effects of poverty — itself a risk factor for health issues — often make findings hard to interpret. Cyndi Swafford of Dayton, Ohio, who with her husband, Jesse, adopted three children affected by NAS, spoke to the conference attendees to urge more services for mothers struggling with addiction. "If you can't care for the moms, the babies can't get what they need, either," she said.